After upgrading from 5.1 I find myself not being able to auto-complete </summary> any longer. When I write "<" The intellisense popup appears but when I continue to type "/" it selects the listed item instead as RS did in v5.1, automatically finding </summary>. I've tried to find in RS Options and VStudio 2010 Options of where I can change to only accept on e.g. Tab but can't find any. Is there any new setting or such I need to change to make RS behave as "I want" (i.e. v5.1) or is this a bug? Same problem here - I start with "<para>blahblahblah", and type "</" at the end of the text. In R# 5, this would give me a completion list which would include "</para>" and allow me to select it. With R# 6, I end up with "<para>blahblahblah<para>/</para>". It also seems to have lost some intelligence. 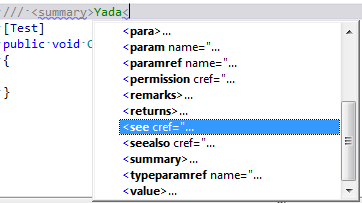 For example, in R# 5, typing "<pa" as a top-level tag would suggest "<param name=...>", and typing the same within another tag would suggest "<paramref name=.../>" and "<para>". In R# 6, all three are suggested everywhere, with the most recent item automatically selected. Added issue in youtrack: http://youtrack.jetbrains.net/issue/RSRP-274853 "Intellisense choosing wrong item when trying to close xml comment tags"